This Project is a proposed ship, to rebuild Titanic's sister ship as a cruise ship. 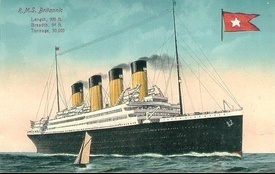 The Britannic was the third and final ship of the Olympic class liners. With the potential success of Titanic II, the drive to recreate her sister ships is getting stronger as well. Speed: 21 knots service, 23 knots max. Lifeboats/Capacity: 18, each with a capacity for 150 people, totaling 2400. Replica Britannic will be the greatest of the replica Olympic class of ocean liners. Her sister ships will be Dennis Lamer's Olympic II and Clive Palmer's Titanic II. She will offer the latest amenities in modern cruising in a 20th century setting of an ocean liner. Her maiden voyage would be from Southampton, England to New York originally scheduled in May 1915 but do the WW1 Britannic was requisitioned as a hospital ship and then sank on November 21, 1916 after hitting a german mine and sinking in 55 minutes. A sad end and devastating blow to White Star Line's trio of Olympic class ships. The maiden voyage of Replica Britannic to America is meant as a tribute to the never attempted maiden voyage of the original Britannic. Afterwards she will undetake cruises from England, America to the Caribbean and worldwide destinations. The Olympic class liners will return to the 21st century.